Getting accurate measurements of distance requires building up a distance ladder using a number of different techniques for various ranges. April 2, 2019 – The history of science is filled with stories of enthusiastic researchers slowly winning over skeptical colleagues to their point of view. Astrophysicist Scott Hughes can relate to these tales. One of an astronomer’s best tools for calculating this is a standard candle, any class of objects that always have the same, standard brightness. If scientists know the brightness of an object, they can determine its distance by measuring how dim it appears to us on Earth. 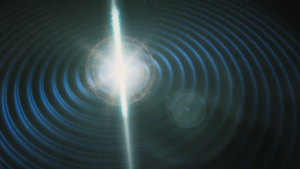 The idea of using gravitational wave sources to measure the Hubble constant was not new. The concept was first proposed in a visionary paperback in 1986 by Bernard Schutz. And a number of other notions regarding gravitational waves were also floating around the literature in the early 2000s. But what Holz and Hughes did was synthesize all these ideas and emphasize the feasibility of combining data from gravitational waves with follow-up observations using light. The study also was the first to use the term “standard siren.” Hughes recalled discussing the paper with Caltech astrophysicist Sterl Phinney, who remarked, “Hmm. Kind of like a standard candle, but you hear it. You should call it a standard siren.” Holz independently had an almost identical conversation with physicist Sean Carroll, a former KITP postdoc himself. Holz and Hughes included the term in their paper, and it stuck. The phrase has since become ubiquitous in cosmology. Two neutron stars collide, sending out gravitational waves and electromagnetic radiation detected on Earth in 2017. 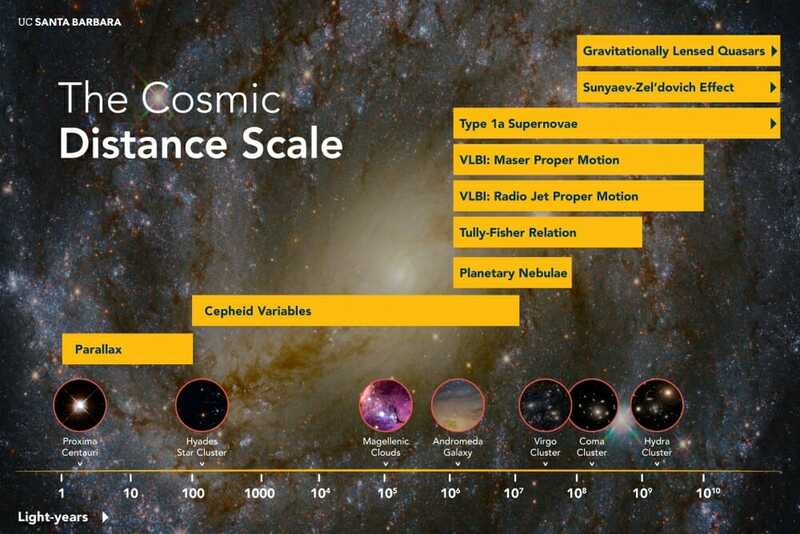 It turns out that cosmologists need another tool, because they currently have two different values for the Hubble constant. 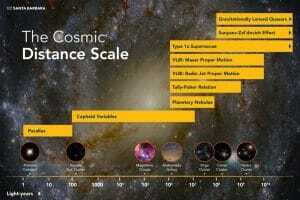 Methods using the cosmic microwave background — faint light left over from the big bang — yields a value of around 68. Meanwhile, calculations that use Type Ia supernovae — a variety of standard candle — yield a bit more than 73.